We start our 2013 programme at the Scottish Vintage Bus Museum at Lathalmond, Fife with a review of the former Edinburgh buses either resident or visiting the museum on their annual open weekend that takes place in August. From the Guy Arab III single decker 739 (ESG 652) through to Leyland Titans, Atlanteans and Olympians, they are all captured, some operating on the ‘internal bus service’ that operates around the site. The independent transport videos cameras now move to the capital city of Scotland to record the current scene. Since our last visit a batch of Volvo 7900 Hybrid single deckers have entered service on route 1. Like the ADL 400H double deckers which we featured on our last programme, they are smartly turned out in the gold livery. There are now fewer buses in the ‘harlequin’ livery and we also observe buses from FirstBus in their new colours. Our filming starts at Waterloo Place and we then move to Princes Street which is almost ready for the trams which will start operating in early 2014. Most types of vehicles are seen here, including some of the ‘ERM’ class of open top AEC Routemaster operating in sightseeing Mac Tours livery now operated by Lothian Buses. A good deal of action is filmed on the busy Lothian Road as the buses turn from and into Princes Street. We then visit Queensferry Street, The Mound and The Royal Mile. At North Bridge we see some of the integral Scania OmniCity double deckers which were formally used on the Airport service. We return to Princes Street and board Volvo 7900 Hybrid, 1 (LB13 BUS) on route 1 towards Clermiston. It is interesting to hear this vehicle in service, as the engine cuts out at bus stops, then pulls away with the electric motor before the diesel engine takes over. We return to the city centre on board sister vehicle number 2 (HY13 BUS). With more filming at Leith Walk and Princes Street we board ADL 400H, 215 (SN61 BCK) for a ‘cab ride’ to Ingliston Park & Ride on service X12. Filmed along most of the route we see all of the action as our camera records the journey from the front, alongside the driver of this superb modern vehicle. 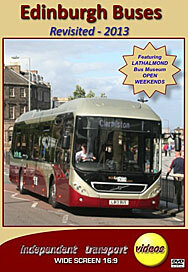 As a bonus we present three visits to the Scottish Vintage Bus Museum at Lathalmond. Our visits start in 2011 and continue in 2012 and 2013. There is plenty of action covering a wide variety of vehicles in various liveries moving around the site at the annual open weekends. We are sure you will enjoy the variety offered on this programme – the main feature of course is Edinburgh buses, but the visits to Lathalmond reminds us of what has gone before!